At the Piano Emporium, we offer our customers a huge selection of both new and used upright pianos for sale across North Carolina and Tennessee. Please feel free to click on either section to begin browsing what’s currently available. 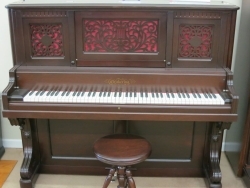 Additionally, if you are searching for a particular antique upright piano or a modern day vertical piano we may be able to help you find what you are looking for, so don’t hesitate to give us a call. 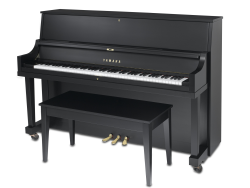 The Full Size Upright Piano: 49″ and larger. String length increases as the piano becomes taller and thus the tone is improved. The keys and action mechanism are also different across the different sizes of upright pianos for sale. For instance, better responsiveness is obtained in a direct blow action found in consoles and larger sizes of vertical pianos for sale. Meanwhile, spinet actions, sometimes referred to as drop actions, are good for the beginning pianist but depending on the advancement in musicianship an upgrade may become necessary. Many upright pianos for sale were labeled “Upright Grand” or “Cabinet Grand”, which suggested a higher quality than most other verticals. Many of these models produce amazing sound quality which rivals and surpasses many smaller grands. Please browse our galleries of new and used vertical pianos for sale, we have something to match every budget and preference. We have two store locations, in Asheville, NC and Weaverville, NC, and are conveniently accessible from Tennessee as well. Feel free to contact us with any questions and we’ll be happy to help you find the best upright piano for sale to match your individual needs.